Now in its 141st Year! Materials science and engineering professionals hailing from more than 68 countries will gather amid the effervescent atmosphere of the Walt Disney World Swan and Dolphin Resort to network, present research, share industrial applications and introduce innovation. This blend of academic, technical, business and social elements creates the perfect synergy to move research and development forward to produce applications that fuel global solutions. This preview of the TMS 2012 Calendar of Events offers the most recent printed overview of the conference for planning purposes. Since the Calendar of Events is subject to change, TMS2012 attendees are encouraged to use the Personal Conference Scheduler (PCS) to create their schedules now or download the new TMS2012 mobile application to plan and monitor live updates. To download the TMS2012 mobile application on an i-Phone or i-Pad, search for "TMS Annual Meeting and Exhibition" in the Apple i-Tunes store, or search for "TMS Annual Meeting" in the Marketplace on an Android. Note that the mobile application and the PCS are not synchronized, so one or the other should be used as a planning tool. 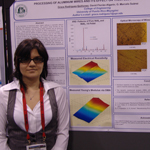 Grace Rodriquez-Quiñones, University of Puerto Rico, Mayagüez, and Parisa Pooyan, Georgia Institute of Technology, won Best of Show honors in the undergraduate and graduate categories, respectively, in the TMS2012 Student Poster Contest. 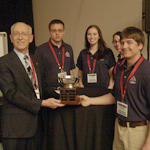 The Colorado School of Mines walked away with the 2012 Materials Bowl trophy after defeating the University of Florida Sunday night. Welcome to TMS2012 in Walt Disney World! Nearly 4,000 of the world's top materials science and engineering professionals are expected to gather this week for the TMS 2012 Annual Meeting & Exhibition.